(1) The detail about being a deaconess makes no difference and pales in comparison to Judas Iscariot who was an apostle. (2) The Lord God Himself declared the following: "When good people turn back from living good lives and plunge into sin, they’ll die for it." (Ezekiel 33:18, MSG). Who determines, ultimately, who gets expelled? The Lord God. Who is the One who also determines the length of our life? Also the Lord God. In fact, if the Lord God wants someone to be saved, what does He do? 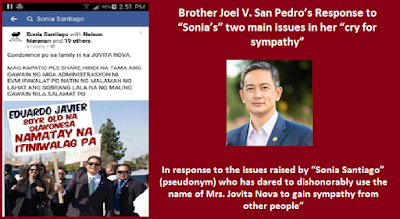 If "Sonia" really believes what her fellow Fallen Angels proclaim that it doesn't matter if you're expelled and out of the Church, then why she is worried about what happened to that former deaconess? If "Sonia" really believes that being expelled and then dying is a great misfortune, then why is she helping people to get expelled? The lesson taught in the worship service recently that was outlined by God's Messenger, Brother Felix Manalo, about those who get expelled was truly timely. The Fallen Angels – Restore Tenny Church leaders are running out of members. Their “Big Bang” comprised only about 80 people. If they were still members, they would only be about 0.00001 of the membership. But they are not members of the Church Of Christ, and that is their big problem. While they try to convince their prospects that being expelled from the Church will not affect their hope for salvation, only a very meager few have been swayed by their “faith alone”-based non-biblical argument. Noticeably absent among those who say "being expelled does not matter" is Jun Samson, who has admitted in TV interviews that being expelled from the Church Of Christ is the same as losing salvation. So what is their recourse? They try to convince people that if they would be expelled, they can simply return one day—when all this is over and they have “restored the Church” by telling people not to worship, not to offer, not to follow the Church leaders, and not to be united—and they can just become members again in the future. Unfortunately for those whom they have deceived, it is not that simple. There are people who are expelled, and they will never be reinstated into the Church. The proof of this was taught in the worship services on May 7 and 8 in a lesson outlined by Brother Felix Manalo. The subtitle of this FB post is the title in English of that Bible lesson of Brother Felix Manalo, the first Executive Minister of the Church Of Christ in these last days. (1) In Matt. 12:31-32, the Lord Jesus Christ spoke of a particular sin for which there is no forgiveness: blasphemy or speaking against the Holy Spirit. Earlier in the lesson it was clarified that the Holy Spirit inspired the men who proclaimed God’s prophesies that testify to the election of God’s chosen ones (2 Pet. 1:21). In the one true Church Of Christ, the Holy Spirit guides the minister who was sent to preach in all that he teaches to the Church (1 Cor. 2:13). The Holy Spirit also guides the one who leads the entire Church in the decisions he makes for the edification and welfare of the Church (Acts 15:1-2,7,12-13, 28). In summary, the leader of God's nation is guided by the Holy Spirit in all that he teaches and decides. To speak against the Holy Spirit is blasphemy and whoever does so will not be forgiven. (3) In 2 Tim. 3:8, the apostles taught the Church Of Christ during their time that one of the sins “leading to death” is to oppose the one whom God placed to lead His people. The man whom God appoints to lead is the one to whom God sends His Spirit to bring God’s message—“the truth”—to the people of God. To oppose the leader is to oppose the truth. To oppose the truth is to oppose God. Opposing the leader is a sin against the Holy Spirit because it is to the leader that the Lord God sends the Spirit of Truth for His people to be led in following His laws and all His ways. (4) According to 1 Tim. 1:19-20, the reason that people who oppose the leader cannot be reinstated to the Church Of Christ is that, by speaking against the Church leaders, they "blaspheme." In the first verse quoted earlier, the Lord Jesus said there is no forgiveness for blasphemy or speaking against the Spirit. In Apostle Paul's time, the two who spoke against his administration--and thus against the Holy Spirit--were given over to satan. The entire Church Of Christ should always remember what Brother Felix Manalo, God’s messenger, taught: there are those who oppose or rebel against the Church Administration who will never be reinstated into the Church even if they want to return. 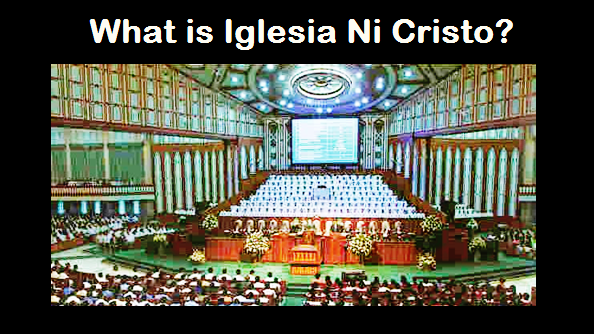 This is why Brother Erano Manalo included 2 Tim. 3:8 and the commandment not to oppose or rebel against the Church Administration in the ten commandments for all members of the Church Of Christ to safeguard their salvation. And this is what Brother Eduardo Manalo continues to uphold today for the members of the Church of Christ to be brought to salvation. The devil knows he is going to suffer eternal punishment on Judgment Day, and he is doing all he can to include as many as he can with him. Those who rebelled against the Church Administration are no different. Don’t let anyone deceive you into thinking that membership in the Church Of Christ is something you can put down and pick back up at your choosing. There are those who rebelled who will never be reinstated. Don’t let them include you with them.